A spectacularly morbid chart is at the top of Reddit’s Data Is Beautiful segment at the moment. There’s no denying that the data is put in a beautifully simple practice, but we’re not sure we can describe it as a thing of glamour in itself. It mainly merely realizes us feel a deep gumption of foreboding. 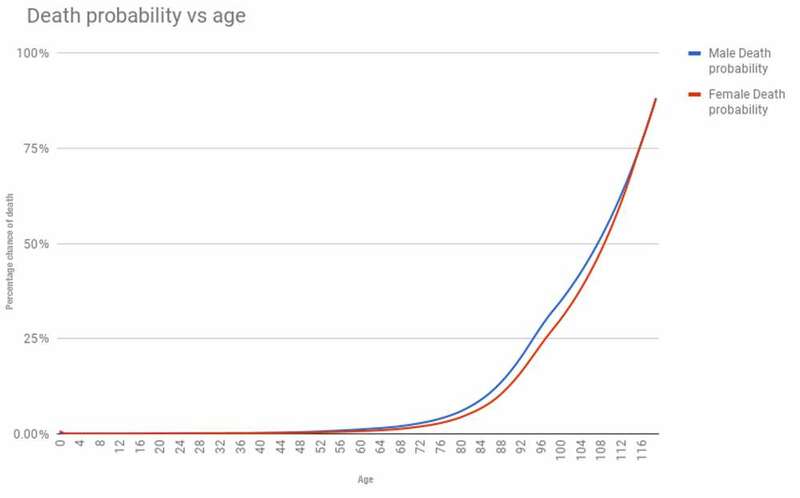 The graph, put together by maxandron, shows the probability of you dying based on how age-old you are. More specifically, it tells you how much the probability of you dying increases by the time you reach the next age bracket, precisely to scare the crap out of you every time you affect another birthday. It exploits data from the Centers for Disease Control and Prevention, which records the number of deaths per 100,000 people at each age on a map. The data can be used to show health risks of extinction at each age( more on that afterwards ), but maxandron used it to show the increase/ decrease in likelihood of death as compared to your previous age bracket. Brace yourself and have a glance. Scary examining diagram, huh? As you’d expect, the probability of dying is down fairly steeply during very early childhood. After a little bit of a wobble in adolescence, the graph depicts a steady inclination all the room up to your late 90 s. Year on year, your risk of demise increases fairly steadily, until you hit 100, where it suddenly rockets. Data from the Social Security Administration shows that by the time you make 100, the percentage risk of you dying that time is 35 percent if you’re a serviceman, and 30 percentage if you’re the status of women. By the time you’re 118, this goes up to an 84 percentage occasion for both men and women. We thought we’d present a slightly better reassuring graph based on the information in the Social Security Administration that shows your percentage likelihood of demise each year. As you’d expect, health risks of death clambers earlier for men than it does for women. The difference doesn’t really begin to stand out until persons below the age of 72. The average life expectancy in the latest available data from the World Bank for Americans is 79.